For the meat : Unlike older trophy bulls who are only good for ground meat, yearling bison produce superior cuts: steaks, roasts, and ribs that can't be beat, in addition to plenty of burger and sausage. For the mount : A young animal can still make an impressive skull mount - and again, unlike big trophy bulls, you do not need a huge room to display it in. For the hide : Tan it with the hair on, or for the leather. 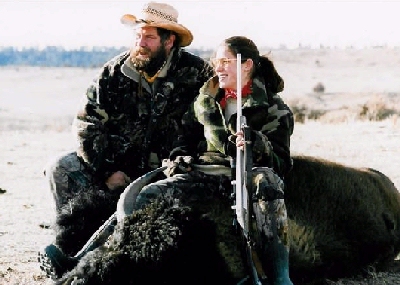 For the experience : You will be partaking in a great, historic High Plains hunting tradition. For the value : You will be paying half of what the least expensive hunts for mature bulls cost. 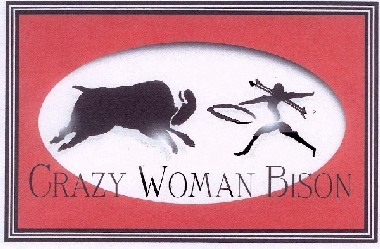 Why hunt at the Crazy Woman Bison Ranch? We are a working ranch, not a game farm operation. Our foundation herd is comprised of cows and bulls from excellent bloodlines, and they produce top-quality offspring. All of our animals are raised from birth in their natural environment, on High Plains hard grass prairie. We see hunting as a far more natural and humane way of restoring the bison to their native habitat, and turning them into meat, than consigning them to a feedlot or slaughterhouse. The field kill not only produces the finest meat, but is most respectful of the animal. The buffalo that you shoot has fed on our grass and grass hay since birth, has never received any feed supplements other than minerals, salt and limited amounts of grain-based feed cake, and has never been inoculated with antibiotics, hormones, or insecticides. The meat from our animals is totally natural. How Does a Hunt Work? You will need no more than one day. 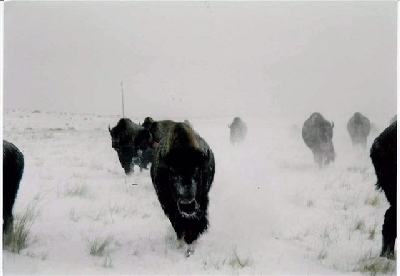 Arriving early in the morning, you will be ready to leave with your field-dressed bison before dark. Our bison roam freely in large pastures. We will guide you. Like other outfitting operations, we will ask you to sign a liability waiver upon your arrival. We will ask you to sight in your rifle on a target at seventy-five yards. This will assure that you and your rifle are accurate. We will take you to the herd, give you your choice among two or three animals, and indicate when you should shoot after you and we have mutually agreed upon your animal. We will give you al reasonable amount of time and up to three shots. We reserve the fight to finish off a wounded bison after the third shot. We do not permit handguns, bows, or muzzleloaders. A magnum caliber, if possible, is recommended to assist in a clean kill. The old buffalo rifle calibers have also proven to be effective. We will not field dress your bison. We assume you will want to do that yourself. If not, given sufficient advance notice, we can arrange for someone local to be on hand to do it, at additional cost to you. You can take your meat with you, or we can refer you to a local butcher who will process your meat and ship it to you, at your cost. We do not currently provide meals or lodging.